I've started putting the Diary together, well I have a little black book which works incredibly well with a pencil & I have a rubber which easily allows me to make alterations! I've decided to let Vanessa deal with the online diaries - if they give her a nervous breakdown I'll be going stratospheric and disappearing in a puff of green wood smoke and I don't want that. If you would like me to demonstrate at your Show or Event I'll be happy to put you in my diary if I'm not already booked and I'm taking bookings for 2018 & 19 too - there are some very well organised folks out there! The Waltham Abbey Workshop is proving a great success in these foggy winter days, insulated & double glazed and with fantastic lighting I'm actually enjoying working in there. I've been doing Sharpening Days on a One-to-One basis where folks have been bringing all sorts of edge tools & the kitchen knives to learn the skills and derive pleasure from the use of a super sweet sharpened axe or draw knife. Don't think some of them have ever experienced that before. So if you're having difficulty with your Green Woodwork make sure the tools are exquisitely sharp - the sharpest edge is where two mirror images meet at nothing but that magical edge. If you can't get there on your own get in touch & we'll see if we can't sort you out. 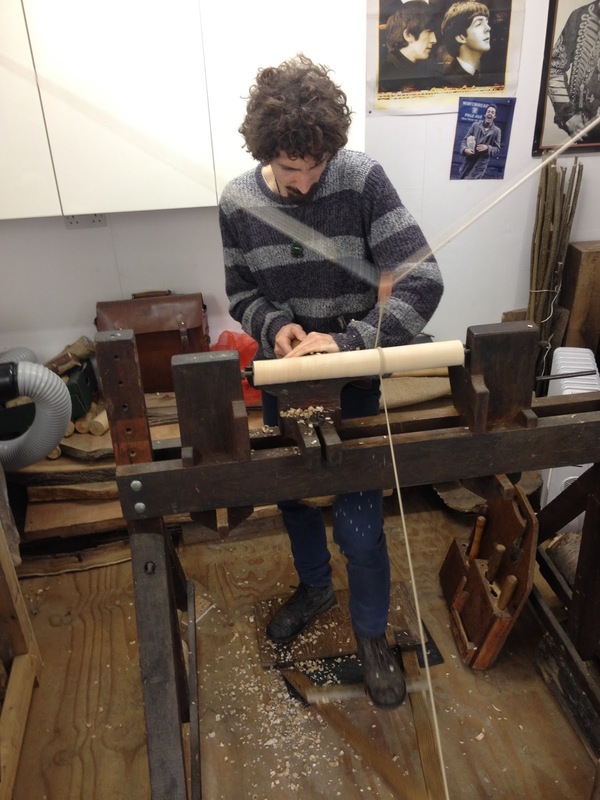 Pole Lathe Turning for Beginners and Improvers have been excellent with some lovely like minded people working so hard and producing beautiful things by hand. I'll take this opportunity to let everyone know that as the Rebel Bodger I'm very flexible with my Courses and always open to suggestion. That's why an Introduction to Green Woodwork became a Spoon Carving Course! So be bold and talk to me - either by email or just get on the old blower or call in at Waltham Abbey and yes we can probably sort out that cider press, make new handles for your favourite frying pans or that ingenious dogs bed you saw fly at Lott's Road Auctions for £4000. The impossible only takes a little longer!